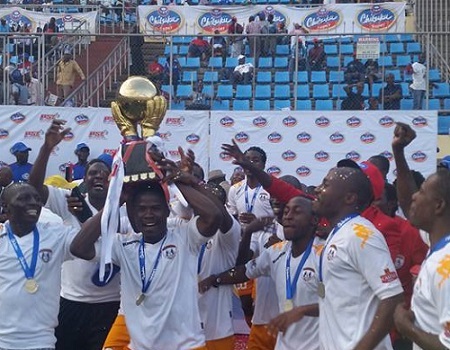 Harare City clinched their first major piece of silverware when they beat Dynamos 2-1 in the Chibuku Super Cup final. Zvikumbawire and William Manondo grabbed the goals for Harare City. Dynamos had the better start to the game creating good chances but failing to punish their opponents. Ronald Chitiyo and Takesure Chiynama on a one on one could have put Dembare in the lead early on. Harare City had their first real chance when Zvikumbawire got himself in the box by could not keep his shot down. However in the 18th minute he did put Harare City in the lead controlling the ball well before shooting to beat Tatenda Mukuruva. Dynamos though continued to come close with Walter Mukanga and Blessing Moyo just missing the target with a long range effort. In the 32nd minute Crispen Dickson almost put Harare City two up when he hit the bar after seeing Mukuruva off his line. Halftime came with Harare City leading 1-0. Dynamos pressed from the start of the second half in search of the equaliser but Harare City remained resolute in defence. Both teams continued to come close but cancelling each other out. With Dynamos pressing high up for the gaol Harare City launched a counter and initially Zvikumbawire had his effort come of the woodwork but the ball fell kindly for William Manondo who made no mistake to make it two. In extra time Dynamos scored a consolation through Richard Kawondera but it was too little too late for the Glamour boys as the ref blew just after the restart. Harare City walk away with $75 000 prize money and a place in the CAF Confederation Cup.